Just saw that Pizza Buona is looking to move. Priced out by rising rent. Sadly inevitable, though it suddenly reminded me of this, probably the closest I ever came to a restaurant review. It wanders off in a series of tangents–music, scenery, a party–and barely mentions the food, which is why I’m me and Jonathan Gold is Jonathan Gold, not to mention better paid. That being said, I did see him play cello in a heavy metal band. But I digress. So we went to Pizza Buona at Alvarado and Sunset yesterday, per Justin Burrill’s and Lee Joseph’s recommendation. The place is a lot less red than I remembered. She ordered a large Special, crispy, which was perfect. The jukebox in the joint was gloriously unhip. Moon River is so unhip it’s not even ironic. Playing the Andy Williams version might be ironic, but this was the straight Mancini. They had Baby Elephant Walk on there too but I was afraid some hipster might walk in and it would show up on his next album. I dig unhip. There’s nothing unhip in Silver Lake anymore but it’s nice to see pockets remain in Echo Park. Got me a salad and I’d have shown you a picture but I hate it when people take pictures of their food. They invent digital technology and what do you all do with it? Take pictures of cats and salads. In the Polaroid days we didn’t waste precious film on pictures of cats or salads. Well cats, maybe. But not salads. Or cats and salads together. OK, salad was good, beer was cold (Moretti), meatballs were good (we got meatballs), pizza was Jersey perfect. The vibe was good too (if not as red as it should have been) and the Burrito King across the street looked good. Never eaten there, but it looked good because it’s still there. That corner is pretty much unchanged since the days when Raymond Chandler could have mentioned it but never did. You used to be able to get brain burritos across the street at the carwash. Wash your car and eat a brain burrito. What is sesos a lady asked. Brains, the guy behind the counter said. Cow brains, I added helpfully. She changed her mind and walked off, suddenly unhungry. I shrugged. The guy laughed. It was a tough town then, full of drive-bys and crack and brains in your burrito. Jonathan Gold probably ate there. Had the brain burrito. Those Pulitzers don’t come easy. One time a friend showed up at our house for a party with a dozen vegetarian bean burritos from Burrito King and a bottle of Cisco. Cisco looks like Orange Hi-C with a mean hangover. He spent the party out on the steps roaring drunk and digesting loudly. You can only hear a slurred Cisco Kid so many times before it loses its funny edge. The Panther showed up and joined him. They ate vegetarian bean burritos and passed the bottle back and forth and belched front and back. They sang and laughed and made loud jokes without punchlines. They became the best friends a man ever had until the bottle was empty. I’m sure neither remember this now, but I remembered while gazing out the window across Sunset Blvd. We waited for our pizza and I put quarters in the jukebox and listened to Enrico Caruso sing Vesti La Giubba from Pagliacci. He recorded that in 1907. The year before he’d been in San Francisco when the earthquake hit. The city fell down all around him and he didn’t like that one bit. But you can’t tell that hearing this. So I played it again, and the pizza came, and it looked beautiful and smelled delicious and I listened to Caruso in rapt silence. What’s he singing about my wife asked. He’s a clown, he tried to kill his wife and her lover, I think. Were they clowns too? Yes, I said, they were all clowns. Sounds sad for clowns. Yeah, it’s a tragedy. She handed me a slice of the pizza, the music swelled, and we ate in silence, listening. 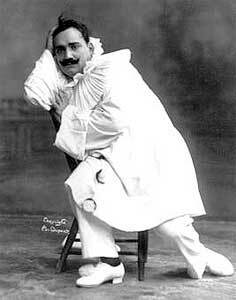 Here’s that same 1907 Recording of Enrico Caruso performing “Vesti la Giubba” from Pagliacci. If you don’t know it by name you’ll recognize the tune after a minute and a half, trust me. This entry was posted in Eats and tagged Elephant Walk, Enrico Caruso, Pagliacci, pizza, Vesti la Giubba. Bookmark the permalink.